115 lbs 11 reps!!!! I was ready to quit at 8 reps but Jason was there pushing me to do more and he helped me eke out 3 more reps. Of course, the DOMS set in around 9 pm last night! I normally don't have any muscle soreness from my lifting sessions because I'm not pushing my limits. It really does help to have someone there to give you that much needed push. 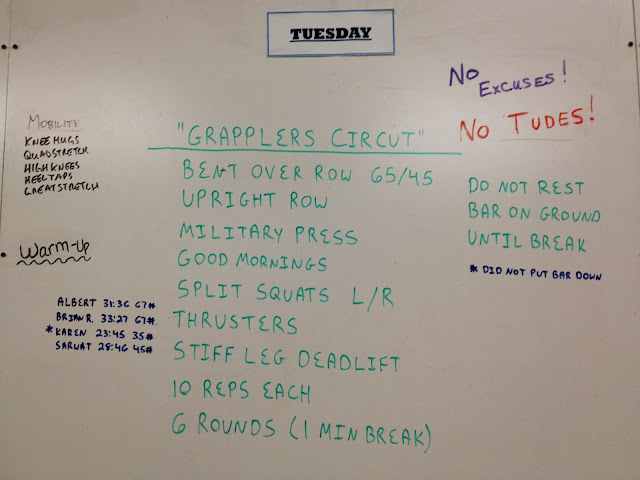 On Tuesday we did the Grappler circuit, which Brian had noted we had done on 5/21 also so I got to see if I improved if any. I used the 45 lb bar for this WOD. I finished in 28:46, in May it took me 32:48, so I shaved 4 minutes off my time at the same weight. Not bad and this time I only put the bar down once during the WOD when my left shoulder was burning and it was unbearable. The other thing to note is that my eating has veered into being more unhealthy due to the preponderance of Halloween candy and baked goods at work so I've made efforts to be more healthy and to just say no to sugar (not completely though). I think a no bread/no sugar month is pending though. I am definitely one of those people who just has to say no completely, the concept of small portions of sweets just doesn't jive with my brain mentality and my zombie like state when eating sweets and chocolate. 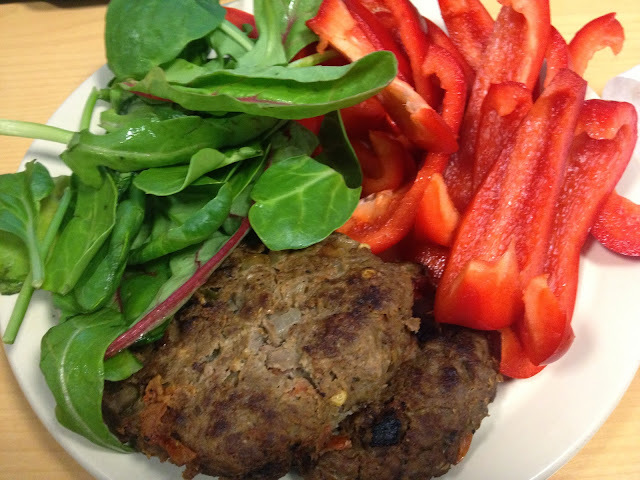 So for lunch the past two days, I have had beef kabobs with salad greens and yummy red bell peppers. And it's filling! 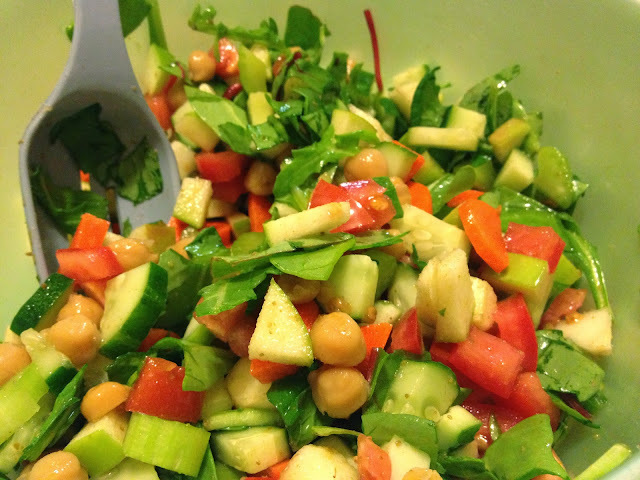 My mom also made a fantastic salad this weekend, making me wish I had someone who would make yummy salads every day (I realize I could do it myself but I am impatient and don't like the labor intensive activity of chopping ingredients).